ISSRs (Inter Simple Sequence Repeats) were employed to compare the genetic structure of Chthamalus stellatus and Tesseropora atlantica in the Azores. The two barnacles differ as regards life cycle: the former conducting pelagic life for about 22 days, the latter for only 24 h. Thirty individuals of each species were analysed from four locations of three Azorean islands. Five ISSR primers produced, respectively, 117 and 79 polymorphic bands in C. stellatus and T. atlantica. Estimates of among-samples genetic diversity suggested extensive connectivity in the former species and isolation in the latter. AMOVA further supported these results by attributing 2% of genetic variance to the among-islands component of C. stellatus and 30% to T. atlantica. 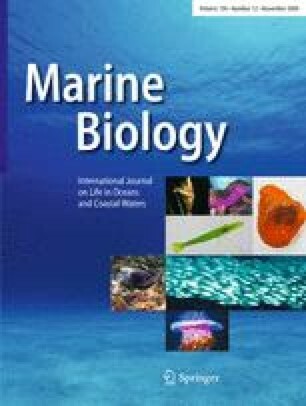 Results are consistent with expectations based on species life history and corroborate the importance of pelagic stages in determining the degree of genetic structuring in benthic marine invertebrates. This article is dedicated to the late Prof Alan J. Southward who raised the questions that motivated this study and provided information, advice and continuous support during the work. The manuscript benefited from the comments of Yair Achituv and two anonymous reviewers. The ISSR analyses represent the work of GM to obtain the Laurea in Biological Sciences at the University of Pisa. We would like to thank Sonia Fontani for help with the fieldwork, Ana Costa for advice on the sampling sites and for providing some specimens and Valentina Milana for DNA extractions. This work was carried out within the European Commission FP5 project EUMAR—European Marine Genetic Biodiversity (contract no EVK3-CT-2001-00048).